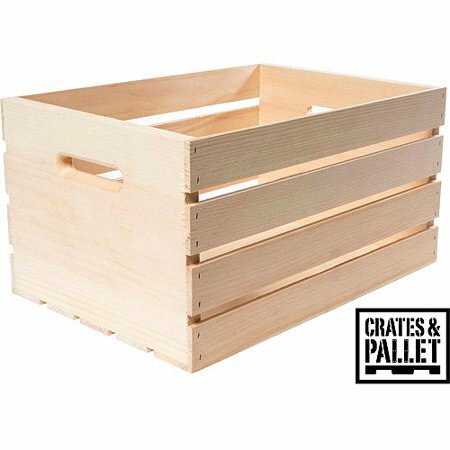 The Large Wood Crate provides both rustic decoration and convenient storage for your home or office. It comes unfinished, so you can add any color or finish you desire to match your decor. Made of pine, it is sturdy and durable and will hold a variety of items, such as magazines or books and more. The slatted sides allow you to view the unfinished wood crate crate's contents. It can also be lifted and carried easily. It holds hanging file folders, so you can quickly find the documents you need at the workplace or home office. Multiple crates can also be stacked to create vertical shelves. Made a crafting table with these! I bought 12 crates and stacked them on a platform. Bought some melamine for a table top and the platforms. Now I have storage and a place to do crafty things! Crates are sturdy and smell like fresh cut pine. I like the smell so I decided to leave raw instead of painting or staining. Total project was $165. After this picture I put a raw pine shelf on the top across the two crates. Spray painted and stacked in TV cabinet of entertainment center to store n display wine n liquor. Looks great n gave a little extra support using black paper clamps as another reviewer suggested Used large n 9 by 9 crates. Loved the result n so easy!!! I own a small, used-book store. I purchased eight of these crates to hold books, and I was pleasantly surprised to find the crates are very well made for the price. They are just the right size to hold an assortment of hardcover and softcover books, they stack very well, they look great, and they don't take up a lot of room they way traditional bookcases can do. I would definitely purchase more of these. I looked into installing pull out drawers for my lower kitchen cabinets in order to maximize storage use but found the cost was beyond my budget. I bought one of these crates and more than doubled my storage capacity so I bough two more. These are better for me than the pull out drawers because they re deeper and hold more. Great quality product. Good size, but a bit more unfinished than I was expecting. Would be perfect if I was interested in sanding and painting. Purchased to decorate for a shabby chic bridal shower. Will use again possibly for other events. I ordered six crates and two came broken. Most of the others were stapled crooked and in generally rough shape. The one or two that was put together correctly and not broken was great, just what I was looking for. I wonder if Walmart even has quality control. The shipping container was in perfect condition so I'm sure that they were packed broken. Disappointed. I purchase from Walmart's website very frequently. This item arrived to me broken. There was no wrapping around the crate, just placed in a box. Very disappointed. This box was very small and flimsy. Arrived damaged. I would not have this item in my store and I sure wouldn't charge $12 for it. This is a box that wouldn't survive a child's play. Why do they not state the dimensions in the ad? That is one of the most important facts when shopping. 1. This product is 18 by 12.5 by 9.5 inches. Will these crates hold a 24 pack of beer bottles? 1. This measures 18.00 x 12.50 x 9.62 inches. 1. The dimensions of this product are as follows: 18"W x 12.5"D x 9.5"H.